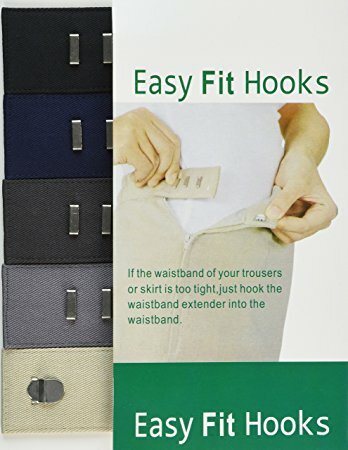 Easy Fit Extenders 5 Easy Hooksspacer.gif5 CLIP Hook n Eye Clasp ExtendersWaistband ExtendersIdeal for Women and MenExtend your trousers or skirt 1/2" to 2"Set includes 5 different colors (black, navy, charcoal, gray, beige)Available also in Buttons (search for Easy Fit Extenders - Buttons)Easy fit Hooks give you extra room in the mid-section! If the waistband of your trousers or skirt is too tight, just attach these adjustable extenders to gain an extra 1/2" to 2". Each set includes 5 different colors (black, navy, charcoal, gray, beige). 100% cotton.Everyone has moments when this device could come in handy! Ideal for temporary weight gain, surgery, travel or after a big meal. Just slips over existing clasp button to add 1/2 - 2 inchs.